Pulparindo tamarind Mexican candy is a hot and salty treat, made from tamarind pulp which is a fruit. Sugar, chilies, and salt is then added giving this Mexican treat a twist. Not only do you get a hot and salty treat, but also a sweet and tart all mixed up in one. 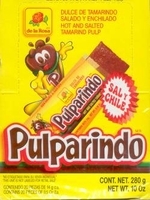 Pulparindo is probably one of the most famous Mexican candies ever. 20 per box. Each individually wrapped.